Sincere thanks to everyone who attended and supported the Valley Disaster Preparedness Fair on Saturday, October 1, 2016. A very special Thank You to those Neighborhood Councils that hosted an Outreach table. We had a great turnout with about 3,000 attending. Over 50% of families responding said they learned about the Fair from Neighborhood Councils. Stakeholders from 69 of the 96 NCs and 14 of 15 Council Districts learned how to be prepared, and in some cases to be better prepared, for disasters and large-scale emergencies. What a great Outreach opportunity! We distributed a Family Emergency Preparedness (EP) Starter Kit to over 1,100 appreciative families to jump-start their preparedness. We also offered Kits containing preparedness publications in Braille with key items (first aid supplies, mask, etc.) labeled in Braille. Fairgoers also enjoyed a free lunch prepared on-site by Calvary Chapel Disaster Relief Ministry. Our Speaker Series of five 30-minute talks with sign language interpretation (courtesy of CSUN Deaf Studies Association) focusing on disaster preparedness was a big hit. The session on pet and service animal preparedness and how to make your own personal kit on the cheap added to the lineup that included Grayce Liu. There was a lot to learn, see, hear, and do at the Fair. Mark your calendar now for our 10th Annual Valley Disaster Preparedness Fair on Saturday, October 7, 2017. Stay informed of our plans at www.ValleyDisasterFair.com. 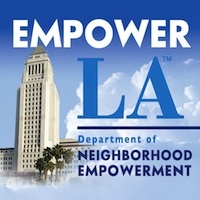 We thank the Neighborhood Councils, Los Angeles Neighborhood Council Coalition, LADWP Oversight Committee, Congress of Neighborhoods, Councilmembers, and EmpowerLA for their support, contributions, and participation in the Fair, and especially our hosts, the crews of Fire Station 87. Many dedicated volunteers made this event possible, some of which serve on NC Boards. We appreciate your dedication to helping all of Los Angeles prepare for disasters. We couldn’t do it without you. See you next year!